Here is pic two from the sleepy winter garden. All of our outdoor pots are plastic. Over the years, we stopped buying potted plants that had to come inside for winter but we still like the look of pots in the garden. A fellow gardening friend shared this idea with me: Cut the bottom out of plastic pots and fill them with soil, placing them in permanent spots in the bed. This gives height to the bed or can elevate other plants over others. You can also use them to fool the rabbits! 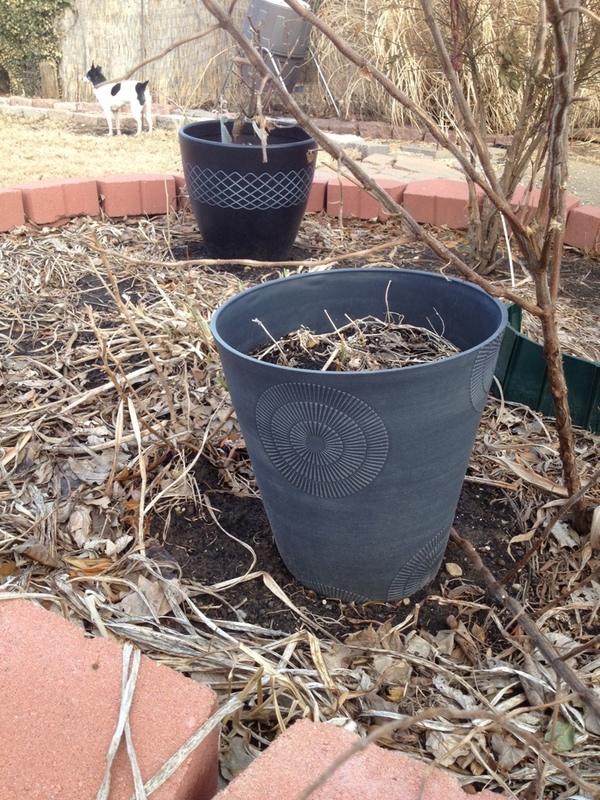 Here we have two pots we placed last year (we have many others). One has a small rose bush in it that rabbits were munching on before when it was in the ground. The other has spring and summer bulbs in it. Cutting the bottom out keeps the pot from freezing or holding too much water; roots can also grow deep for nutrients from the ground.